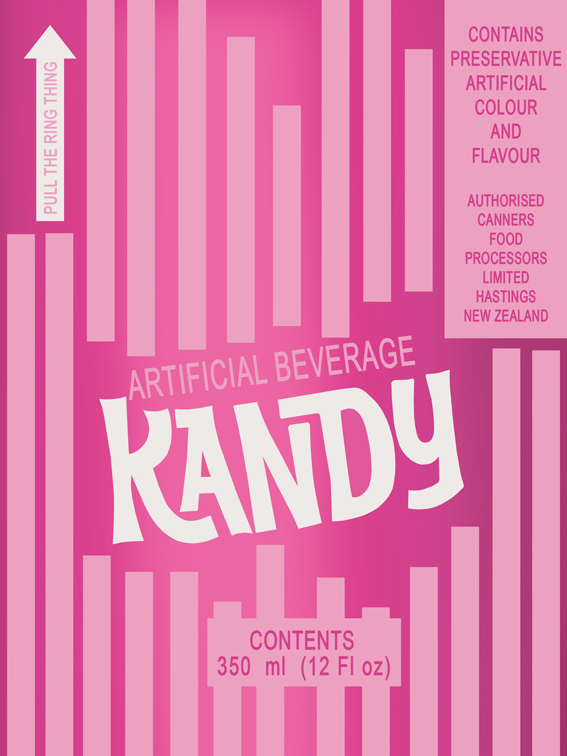 Kandy was a drink I remember very well from my childhood, although – I don’t know if we were ever actually allowed it – I think it was probably a bit too trashy so it stayed on the shelves at the dairy. Not to mention that there’s not one thing about it that isn’t man-made. Its pop-style garishness signifies that Australasian obsession I’ve mentioned before – a fascination with all things American and retro in the mid-late 1970s period, probably inspired by the popularity of TV shows like Happy Days, Sha Na Na and Laverne and Shirley (and inspired Rocker stylings in adverts like Bluebird chips, Perky Nana, and Sparkles) at the same time as Kiwis were busy un-tethering their Union Jack apron. 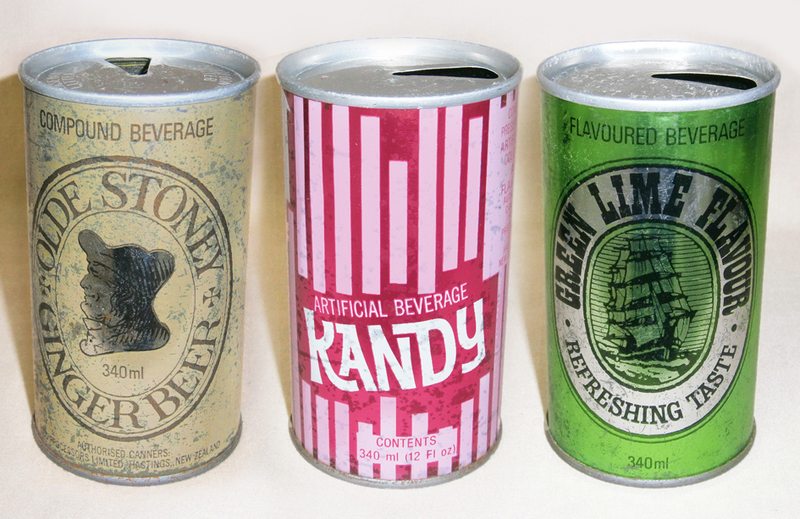 Three drinks manufactured by Food Processors Ltd: Old Stoney and Kandy are 1970s versions, Green Lime Flavour is a 1980s product. It was manufactured by a company named Food Processors Limited, which I think was a sub of Wattie’s under the General Foods Corporation umbrella. Food Processors Ltd also made Old Stoney, a popular canned ginger beer which was around through the Seventies and into the late Eighties, maybe longer, and others like one that was just called Green Lime Flavour. I think that Wattie’s probably acquired Food Processors Ltd in the 1980s as suddenly their logo is emblazoned on some of the later cans. 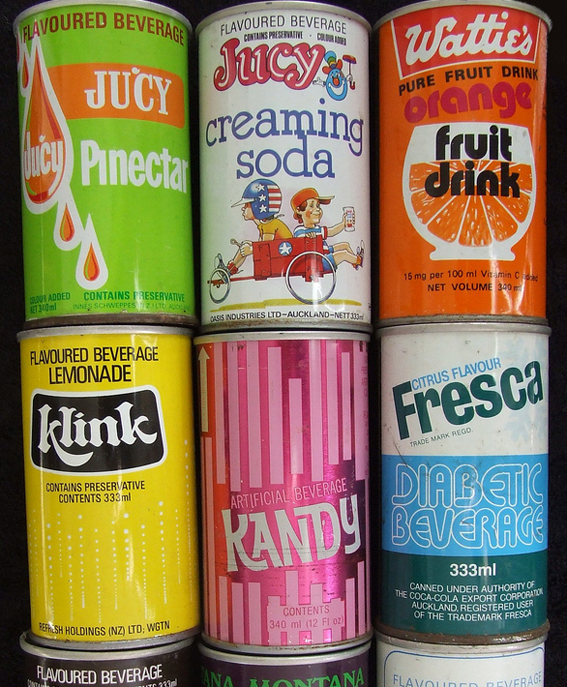 A selection of late 1970s-early 1980s drink cans; One of the Wattie’s products under their own brand top left. Image courtesy of and © Steve Williams collection. Wattie’s of course also did a large number of drinks in the 1970s and 1980s that readers will remember like Pasito, Frist, Lemonz, and Life. Most of these are not too hard to get on auction sites and come up on a fairly regular basis. Under their own brand Wattie’s did canned lemonade, sparkling lemon, orange fruit drink , and lemon fruit drink. Also a range of fruit nectars – peach, pear, apricot, and nectarine. Citrus and tomato juices were of course a mainstay of the product roster through the decades and were produced from the 1950s onwards.